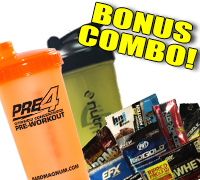 10 Assorted Sample Packs + 2 x Assorted Branded Shakers! This sample pack contains 10x Assorted Product Samples! Choose from our large selection of Shaker Cups, perfect for mixing your favorite Supplements in!